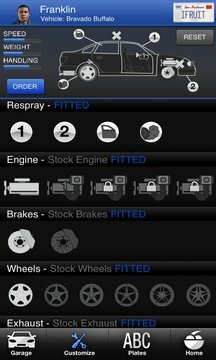 The Los Santos Customs app offers players the freedom to create their ultimate vehicle in Grand Theft Auto V from anywhere. At the bar, on the beach, on the toilet. This is the future, we’re almost sure of it. 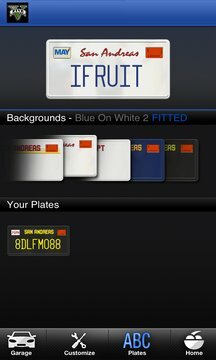 You can even create and reserve custom license plates for both Grand Theft Auto V and Grand Theft Auto Online – order your personalized plates before they’re gone! Depth of content, high production values, defecation. It’s the app that has it all. Because who doesn't love tending to a virtual pet? Chop is Franklin’s canine sidekick in Grand Theft Auto V. Look after him well in the “Chop the Dog” app and you will reap the benefits when playing as Franklin in Grand Theft Auto V. Pet him, feed and water him, play fetch and tug-of-war, teach him tricks. Too much or too little of an activity, however, will cause Chop to become unhappy, and nobody likes an unhappy Rottweiler. Take Chop on walks to give him a chance to work off last night’s steak and Piswasser and to mark his turf in the hood - defending his ladies, fending off gang members and even protecting the beach babes of Los Santos from unsightly tan lines by removing their bikinis.